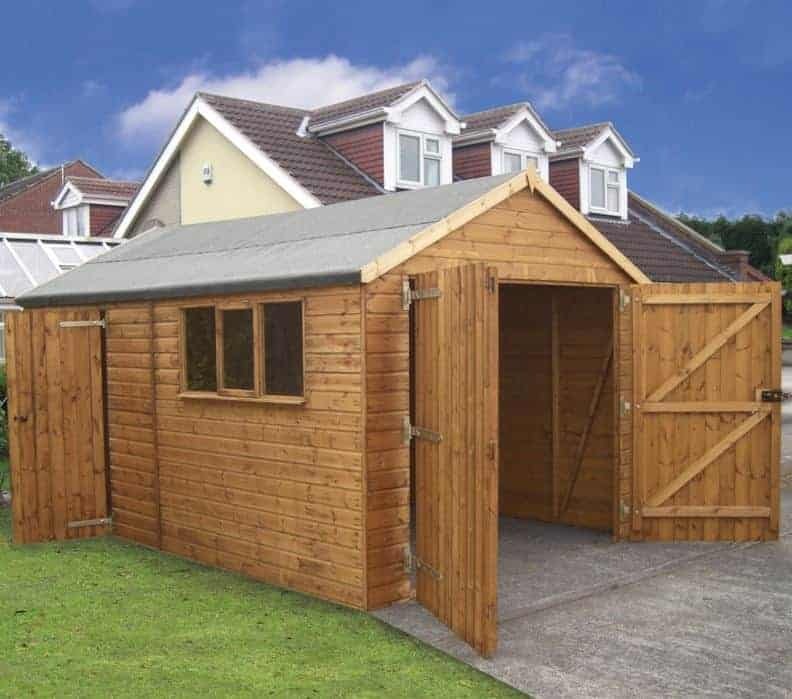 This large wooden garage can easily accommodate a typical family car, creating a secure storage space and protecting it from the vagaries of British weather. It features double doors at the front and a side access door and also has three windows, one of them opening to allow ventilation. 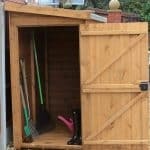 Because of these factors, we feel that this could also be used as a well sized workshop, or even as a large garden shed. The apex roof at the summit effectively carries rainwater away, and it also creates a very tall building with lots of headroom. Whether you’re planning to store a car inside or tools and equipment, you won’t need to worry about how tall it is. The tongue and groove cladding also enhances the weather protection offered by this garage, as its tightly interlocking nature means that there is nowhere for water to seep into. We were very impressed with the high quality cladding used, and this was a mark of the quality we found replicated across the building as a whole. It was a pity however, that a more effective preservative treatment hasn’t been used, and that it doesn’t have an extended warranty beyond the statutory one year period. We review lots of garages, but for aesthetic appeal it’s hard to beat a traditionally styled timber garage, such as this apex roofed garage. We found it instantly eye catching, so it will become more than simply a place to park your car, it will become an attractive feature for your garden. Thanks to its size and flexibility, we also feel it could be used as a workshop for either business or leisure purposes. At the top of the garage is a tall apex roof, and we were pleased to see that it was made of the same tongue and groove cladding as the rest of the building. It’s covered in a strong mineral felt, and is excellent at carrying water away. Just how tall and accommodating it is can be judged from its ridge height of 2.67m and its eaves height of 1.85m. When selecting a suitable area of level concrete on which to position the garage, keep in mind the external width of 3.05m and the external depth of 4.28m. The tongue and groove cladding was the feature we found most impressive about this garage. That may sound strange when you consider that its thickness of 12mm is the same as that found on the majority of large timber buildings we review, but on this occasion PAR cladding has been used. This is high quality timber that’s been planed all round, and this gives it strength that’s equivalent to 16mm of standard cladding. 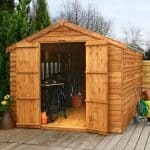 We also liked the heavy duty 45 X 45mm frame, and once assembled the garage as a whole seems strong and stable. There is no floor included, as the building is designed to be affixed to a pre-existing area of level concrete, or possibly a patio area. There is, however, a timber base rail running around the perimeter which means that a floor can be fitted inside if required. Whilst we found the cladding impressive, we were less impressed by the pre-treatment used by the manufacturer and its impact on the garage’s warranty. At this price we would have expected a long lasting pressure treatment to be used, but instead the timbers have been given a single dip treatment. It’s one reason why the building comes with only a one year warranty, which is the bare minimum that can be supplied. This lack of an effective treatment also means that the treatment requirements may be considered onerous by some customers. Not only is an annual treatment with wood preserver necessary, which can be a big task on a building of this size, there is also a requirement for the timbers to be treated six weeks after installation. We liked that there are two doors on this garage, double hinged doors at the front and personnel door at the side. This makes it very convenient to get in and out, even if a car is currently parked inside. The double doors are very wide, at 2.13m, which is what we’d expect from a garage, but also tall at 1.88m. The single door is also generously proportioned, and we were pleased to see that it can be positioned on either side of the garage thanks to interchangeable panels. Once inside the garage you notice just how bright and airy it is, and that’s thanks to three windows which are fitted adjacent to each other. The outer windows are fixed in position, but the middle window can be opened which makes it easy to ventilate the interior and easy to regulate the temperature on a hot day. We were glad to see that horticultural glass is used for the glazing. You can’t tell the difference when looking through it, but it’s much tougher than standard glass and shatter resistant as well. This in itself can help repel an attempted break in, but it’s a pity that stronger security features are missing. While both doors feature a padbolt to secure them in place, neither of them include a padlock itself. These are therefore a must purchase along with the garage, but it’s a pity that they weren’t included as standard. We found the windows performed a useful function in illuminating the garage, but we appreciate that some people prefer a more private and secure environment where people can’t see what’s kept inside. That’s why we were pleased to see that customers, at no extra charge, can opt to have a fully boarded garage with no windows at all. Alternatively, there’s an option to convert one of the fixed windows into another opening window, which can come in very useful if machinery is being operated inside. One further option that we think could prove very useful to some is a professional installation service. Although it costs £269.99 it can save a lot of time and potential frustration, and will be a relief to those who are daunted at the thought of self assembly for such a large building. The high quality PAR cladding was the most obvious sign of the high quality components that are used throughout this building. With a pressure treatment applied this would be a very durable garage, but it’s a pity that the emphasis has been placed on the owner keeping up with the yearly treatment requirements. Whilst we have reviewed much larger garages, this is still large enough for a typical car and can also be used as a spacious workshop. 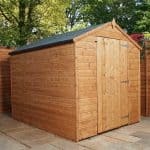 Whilst the manufacturer estimates that two people can install this garage in around five hours, we would advise people to allow for double this amount of time. 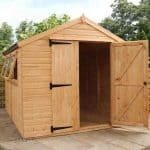 For a large and attractive timber garage this represents reasonable value for money, especially given the superior tongue and groove cladding used. Final Thoughts: We liked the look of this garage at first sight, and especially like the fact that it can easily be converted into a workshop thanks to its natural source of light and ventilation, and its two access points. Whatever is going to be stored inside however, you will need to add a pair of padlocks and an alarm. These needn’t be an expensive purchase, however, and the greatest extra cost will come from the need to apply a large amount of wood preserver every year. 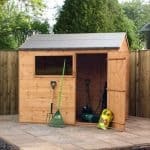 This will also take some considerable time too, of course, but if you’re prepared to make that commitment then this is a very high quality wooden garage.